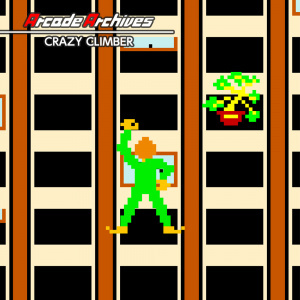 HAMSTER has brought numerous retro titles to Switch, but Arcade Archives Crazy Climber is the furthest it's gone back in time yet, with a game that actually predates Nintendo’s first console. 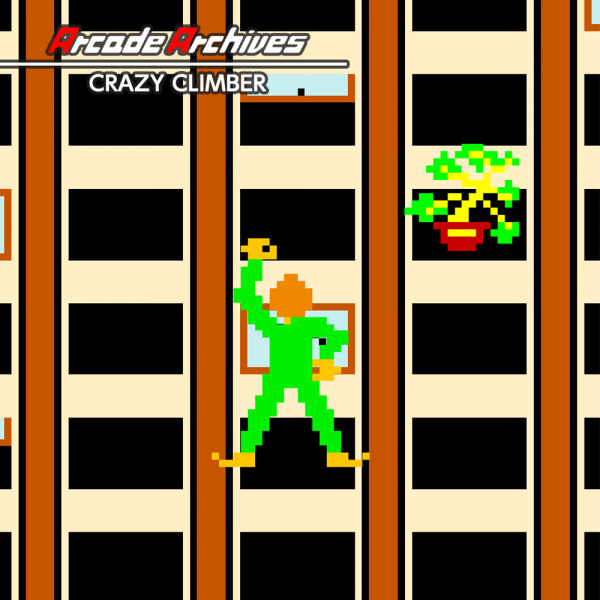 Arriving in 1980, the year before Jumpman climbed ladders to rescue Pauline from Donkey Kong, an unnamed climber scaled the sides of tall buildings in Nichibutsu’s Crazy Climber. There’s no in-game story reason for this, but you get points for doing so and if you want more points, you’ve got to keep climbing. In order to make it to the top of the building there are numerous things you must contend with, the first of which being the controls. Our protagonist is no Spider-Man so you’ll need to put in a bit more effort than simply pushing the control stick to crawl your way to the top. In fact you need to use both control sticks (one for each arm) as you use open windows to work your way upwards. You can also move sideways when required; buildings at their widest being six windows across. There is a logic to the controls (up to reach up, down to pull yourself up) but initially they can seem quite fiddly. It’s possible to use a single arm to climb, but get into a rhythm with both sticks and your ascent will be much quicker. Arms can be reached out to the sides, positioning yourself between windows and enabling you to reach above a closed one to continue your climb, rather than move around it. Often moving around it is the best option however, and in order to shimmy left or right you must push both sticks in the required direction. After a while, the controls become natural, although there are occasions where you find yourself stuck between windows and have to think how to position your arms in order to move in your desired direction. Visuals are unsurprisingly basic, but bright colours and simple but effective animation makes the action easy to follow and the dangers clearly displayed; death coming due to slow reactions rather than unseen troubles. Someone scaling the building without any equipment may be an impressive feat, but the residents are not happy about it. So unwanted is your presence that some will pull their windows shut, requiring you to change path or move quicker so as your makeshift handhold does not disappear. Other residents will drop plant pots towards you, which like a window slamming on your fingers will send you plummeting to the ground below. One way you can deal with these horticultural projectiles is to plant your feet (push down on both sticks) which will cause the pot to bounce off your head. It's very useful, but this move also requires quick reflexes. It’s not just the residents that cause you trouble there’s also a fire-pooping bird and, incredibly, a large ape that moves from one side of the building to the other and will try to punch you off. Later levels features more items dropped at you such as girders, dumbbells and billboards. You may also come across electric signage with a detached cable. A small shock will simply change the colour of your sprite, with a larger one being another way for you to drop from the building and lose a life. 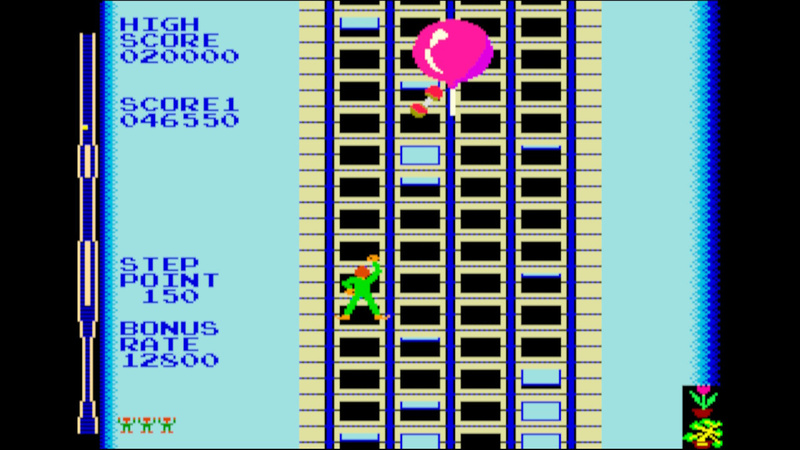 The only help you may find is from a balloon that--if grabbed--will transport you up a few floors. Points are awarded the further you climb and should you make your way past all these dangers and reach the top of the building, you’ll find a helicopter hovering about. Grab on to it before it flies off and you’ll receive a points bonus, with further points awarded based on how quickly you climbed the building. Whether you grab the helicopter or not, you’ll soon find yourself at the bottom of the next building (four in total), ready to climb again. There’s some simple music at the start and end of stages as well as when the bird and ape make an appearance. In between these moments there’s just the basic sound effects as you move upwards as well as from the bird and ape as they attack. Dropped items also make noises, with dumbbells/girders being quite irritating, but the hollow sound of a plant pot bouncing of your noggin works well as does the subsequent reaction from the climber and the yelp should he be falling. Having got the hang of the controls you can set about improving your score. Having reached the top of the fourth building, you are sent back to the first and the cycle repeats until your lives are gone. As scoring high is the only aim of the game and there are no continues, the original arcade mode and the Hi Score mode are very similar. Dive in to the options and the original mode can be made a little more difficult by increasing the score at which you are awarded an extra life, but it can also be made easier by increasing your stock of lives to six (rather than three). Alternating two-player is also available should you wish and HAMSTER’s usual Caravan mode is also present which limits you to five minutes of playtime. However you play, the aim remains to improve your score and each mode has an online leaderboard for you to try and improve your placement on. Once you’ve got the hang of it, the first level is fairly straightforward, although unexpected closing of windows and the sudden appearance of dropped plants can still cause trouble. 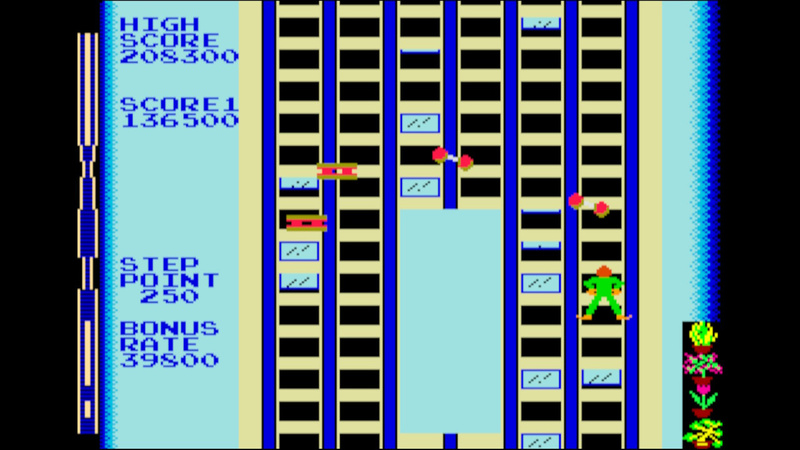 From the second level onwards the challenge increases with more items dropped, more windows closing as you approach them and an increase in narrow sections of building. There’s no ending sequence to play for, but there’s replay value in the game from trying to improve on your score, particularly if you just missed out on your goal. Crazy Climber is a game with a simple premise: just climb! There's a good range of dangers to contend with and although the game shows its age, the action is easy to follow. Audio is also simple, but only the falling dumbbells and girders annoy, with the rest having a simple charm about them. There's enjoyment in finding ways to improve your score whether climbing more buildings or climbing the same number, but faster. 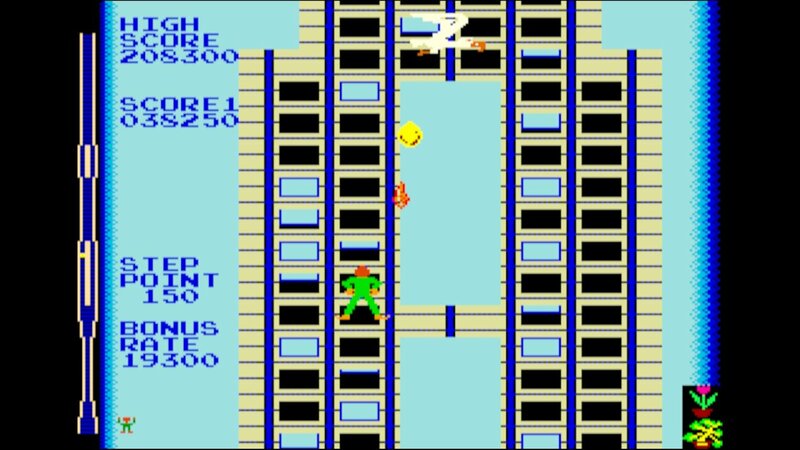 The nature of the controls mean it doesn't have the same pick up and play simplicity of a Space Invaders or Pac-Man, but Arcade Archives Crazy Climber can still provide high score chasing fun. I have no nostalgia for this title and the look doesn't appeal to me in modern times. Pass. Wouldn’t even touch this a 10ft pole... omg, I think I just threw up a little bit in my mouth. I’ve been around since the 80’s but unlike many nostalgic gamers- I rarely look back. Especially this far back. I didn't know they were putting out early 80's arcade games? There are plenty I would want to buy,especially from Atari,Williams,and Midway. I hope these arcade archives start releasing once a week like their Neo Geo games! Fingers crossed for Bomb Jack and Ring King. Baseball Stars Professional would be a far better choice, Hamster! I appreciate the game, but don't know I would play 32 quarters worth of games to justify picking this up. Same for the Namco collection. For $30, they need to add more games to it. I know devs hate this, but I will wait for a sale. I got this one, and it's a great game. But it's unfair, but that's what makes it a challenge. I can't get past the second level, but it took me a while to get past the first. I'll admit though, this'll be a game that you'll like or really dislike. It's a very marmite-like game. @Tandy255 Devs don't hate sales per-say. In fact, Team Meat makes a lot of money when Super Meat Boy goes on offer on Steam. What devs wont like is a game that permanently goes down in price. It's a 10 from me. Addictive gameplay and awesome memories from the past. @NandN3ds Hamster is releasing a bunch of Japanese arcade games on the PS4 and Switch. There's more games on the PS4 at the moment, mainly due to the PS4 coming out before the Switch, and that Hamster needs to get separate licencing agreements to release each game on each format. Seeing as Hamster has shaken hands with Irem, R-Type will soon be coming to the PS4 and Switch. Early 80s games though, the PS4 has (From Hamster's Arcade Archive) Moon Creasta, Exerion, Karate Champ (I hope this comes out on the Switch! ), Mr. Goemon, and Front Line. @NandN3ds Speaking of American and European arcade games. I'm not too sure if Hamster would be interested to release them. Here's hoping that someone like Digital Eclipse can make agreements with Western arcade companies to release games like QBert, Joust and Marble Madness to modern consoles. It'd be nice to finally play this without the joysticks being messed up (happened to me almost every time I saw this game, back in the day). But, now's not the time, sadly. Onto the wishlist it goes. @RetroGamerAndrew I actually went back and completed (ahem credit-fed) SNOW BROS. via emulation this past Christmas. I did the same for the similar style game NIGHTMARE IN THE DARK at Halloween which was a Neo Geo title. Fingers crossed we might see the latter as part of Hamster's releases. But you're right, even within the single screen, maze puzzle genre there are loads of fun games (Data East made at least three on their own JOE & MAC RETURNS, TUMBLEPOP, DIET GO GO) I'd love the chance to play on Switch. @Lroy I just looked up Nightmare in the Dark, and dude! I would love to play this on my Switch! @SepticLemon Yeah, fun little title with a welcome gothic horror theme. What's with the star by your name? Does that mean you're staff here? I vaguely recall seeing other NLifers having such a demarcation or quite possibly I'm going senile, lol! Anyways, let's hope there are no licensing snags and that Hamster can get NIGHTMARE IN THE DARK out on Switch in time for Halloween 2018. Now this is 80's arcade gaming. I prefer the sequel which looks much better. Seeing some salt in the comments is hilarious. Games like this were meant to be played in short bursts until mastered because---surprise!---they're arcade games. (The difficulty should come as a surprise to no one.) Luckily, the Switch is a perfect fit for this genre. My only complaint is that I still can't organize all the retro goodness into one folder on the Switch. @Lroy I got the star from writing the review for Flip Wars. As for Nightmare in the Park, there might be a chance as it's a NeoGeo title. We'll have more of a chance of seeing this than Hamster releasing a western arcade game. @SepticLemon Oh nice, I'll have to go back and read it. Yes, I'm crossing my fingers all the Neo Geo titles make their way over to Switch. the artwork looks like something you'd see from Hanna-Barbera. 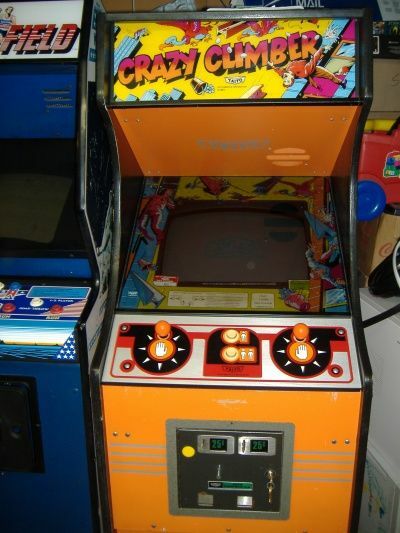 Wow I remember when this came out in the arcades...I only ever played it once or twice back then, it was quite hard. I like this game quite a bit, but slightly disappointing that, like the PS4 version, there is no way to configure the controls to dpad (or arrow buttons) and buttons, which worked well on the JP SNES version. Especially disappointing if you want to play it with the RAP. The dual analog does work well, though. This is one game I’ve never heard of and given its rather boring look, I will pass for sure. @Lroy All of them are going to be tricky. Not to mention that people aren't going to download every game either. Like, how many people really want to play the bad NeoGeo games like Super Spy, Cyber Lip and Ragnagard. Yes, there's a few bad NeoGeo games out there! I spent a lot of cash in arcades back in the day, but I have no desire to replay them now. Except perhaps for Skramble. And Pleiades. And Hyper Olympics, of course. And Galaxians. Ok, just not Crazy Climber. i remember years ago downtown in houston texas, there was this guy that was climbing buildings in this fashion that made the news because he didnt have any clothes on, it was crazy. i got a huge fine for it but it was worth getting on tv for. @manu0 ...or is Donkey Kong a funny looking Crazy Climber gorilla? After all, this did come out a year before Donkey Kong! @Lroy Windjammers will be tricky as Dotemu has the agreement for that game. Hasmter can't port Windjammers onto their ACA NeoGeo series. So the only way that would happen is if DotEmu ports the game to the Switch, but seeing as WindJammers is exclusive to the PS4, the only way it would happen is if there's a time frame in the agreement that would allow DotEmu to port to game to other systems. From that perspective I’m really enjoying it on Switch, but I can totally see how anyone who hadn’t played it back in the day wouldn’t be impressed! @slider271 I haven't played the original arcade game before. But I did see this in a review in Nintendo Magazine System for Nichibutsu Arcade Classics for the Super Famicom. I kept looking at the screen shots wondering how you actually play the game. I had no idea that the original game had two joysticks when I found out more about the game about 6 years ago when I saw a video about the game on Youtube and found out about how it used a joystick for each hand. @SepticLemon Count me in for The Super Spy! @SepticLemon I can’t imagine playing it with buttons on the Super Famicom! @slider271 Well, I would imagine that would play it by imagining that the A, B, X, and Y buttons are a substitute right joystick. So you'll be alternating between Up and B, and Down and X a lot in order to climb. @FinalFrog Well, Pleiades and Phoenix MIGHT have a chance to appear on Arcade achieve as they were published in Japan. Taito published Phoenix, and Tehkan (Now Tecmo) published Pleiades in Japan. As for Gorf, it never got a Japanese release, not to mention that the game is VERY trademark infringing! lol! @Bondi_Surfer Scramble is released on the PS4 through the Arcade Archive series, so there's a chance it'll be released on the Switch. But there's going to be a legal wall to get over to get the licence agreements to release games onto another system. So no real idea when it'll happen. But having Scramble on the Switch would be awesome! @SepticLemon Yes, I thought as much. Wow a dream come true although I thought it looked better from memory ( maybe the lack of CRT sheen/ contrast). I pumped so many quarters into this thing waiting on a hoagie and soda, or just hanging out loitering. 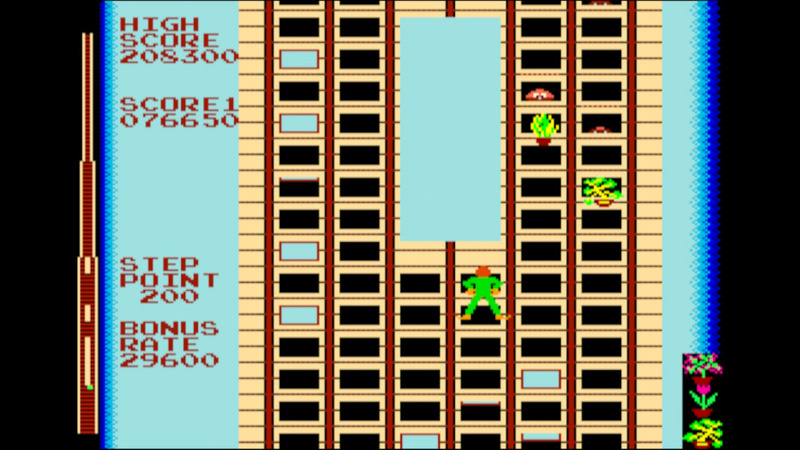 i remember disney's wreck it ralph 1983 inspired game was free. And it was fun for a while and that looks better than this rubbish lol. Not sure if you can still get wreck it ralph for free on pc though!. Atari 2600 looking...hasn't aged well. On the bright side you can probably get it without having to install an sd card! Would have been cool back in the day! update on my last post yes you can type in wreck it ralph fix it felix game and you can play it for free!. On the internet search engine of course not on nintendo life site rofl. 38 years later and still having fun with this game!! Keep em coming!! @guamyankee Funny you mention that since there is an Atari 2600 version of Crazy Climber. I disagree that it looks like an Atari 2600 game, though. I hope this means we might see more Taito classics like Elevator Action or Jungle King (Hunt). @bones I wouldnt be so quick to gauge a game as Rubbish just because it looks dated. There are some older games that imo are still fun and challenging. It may not translate as well without the cool arcade cabinet and hardware, but gaming should be enjoyed from all ages and genres. We don't need ports of B-tier games from nearly 40 years ago with no nostalgia. No interested. There are better classic titles to choose from. Would you consider an Arcade Archives Kid Nikki Radical Ninja review? It's been out for weeks. @daveisbored Sweet! I was hoping to read what they thought about it not being the US version even though it's on the shop as Kid Nikki. I'm addicted to arcade games from the days of yore. I never played it. I'll be picking this up if not for nothing more than a curio in history.